China Gets A Big Dose Of Fine Art Photography : Parallels China's largest fair devoted to fine art photography opened in Shanghai this weekend. 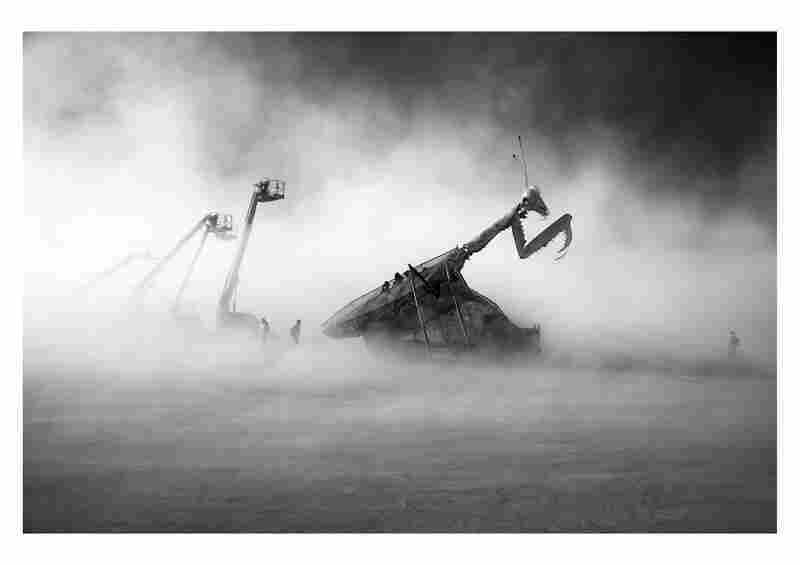 The first-time event includes more than 500 works from photographers around the world. Zhang Kechun; Under the Abandoned Pier, 2013-2014. 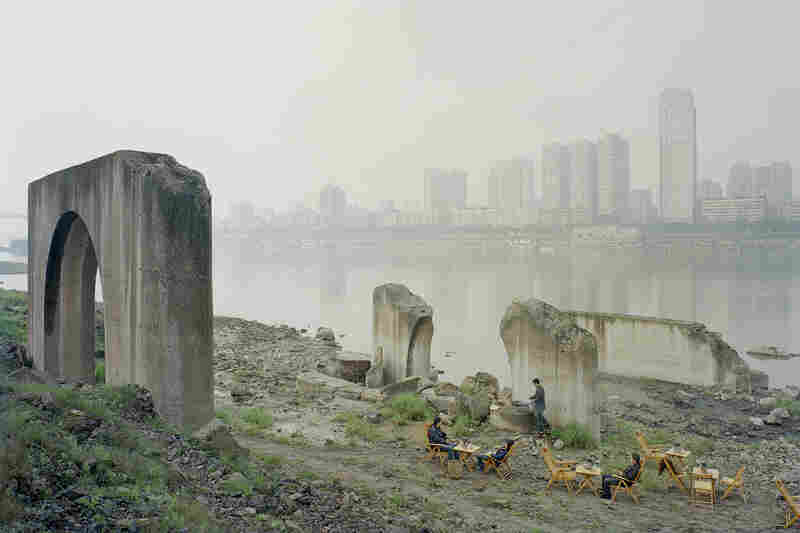 Zhang, 34, spent years shooting photos along the Yellow River. The figures are tea sellers. Liu Di; Animal Regulation – No. 18. 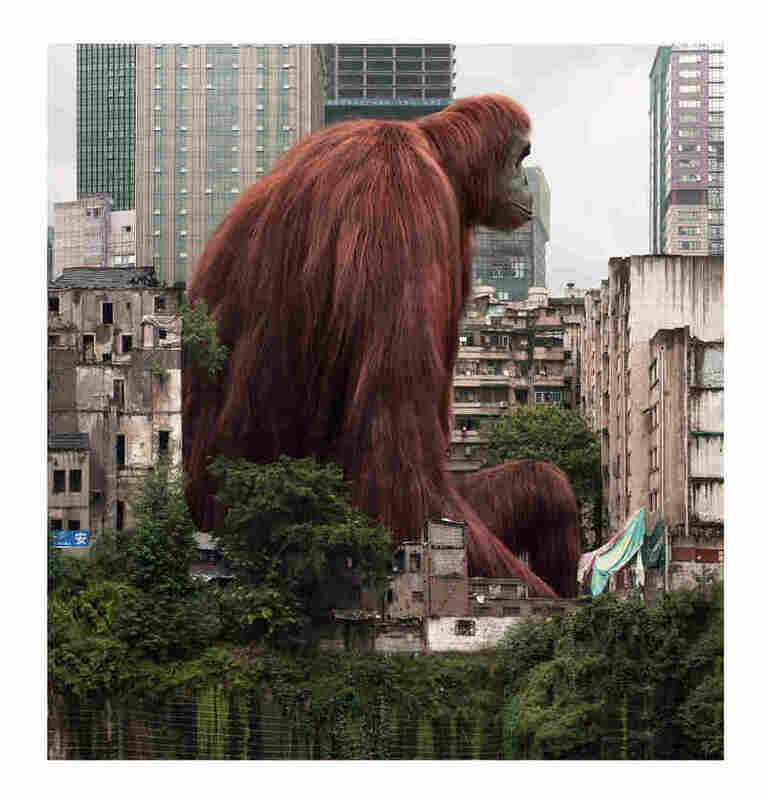 Liu is famous for placing huge animals with small heads in urban landscapes. Peikwen Cheng; Praying from the Lost and Found Series, 2010. Ho Fan; Street Scene, 1957. Ho Fan/Courtesy of AO Vertical Art Space. Peng Jiang; The Nirvana of Phoenix. No. 14. A derelict state-owned iron and steel factory in Chongqing. 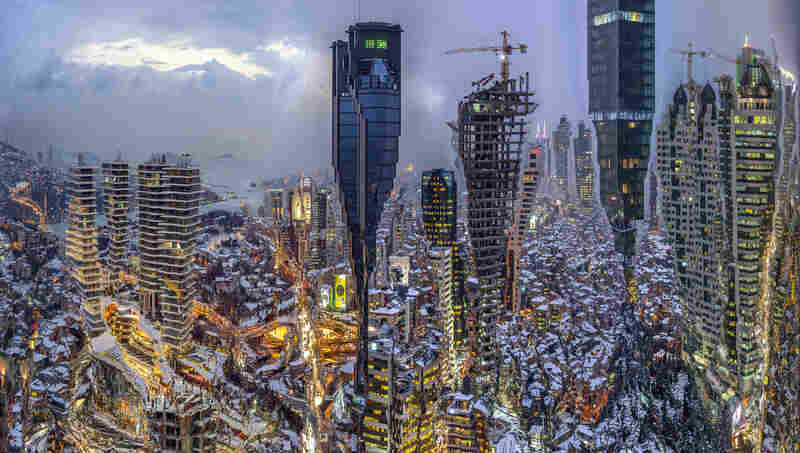 Murat Germen; Muta-morphosis Istanbul Zincirlikuyu #1, 2013. Germen says people routinely mistake this for a collage. It's actually a compressed digital panorama of Istanbul. 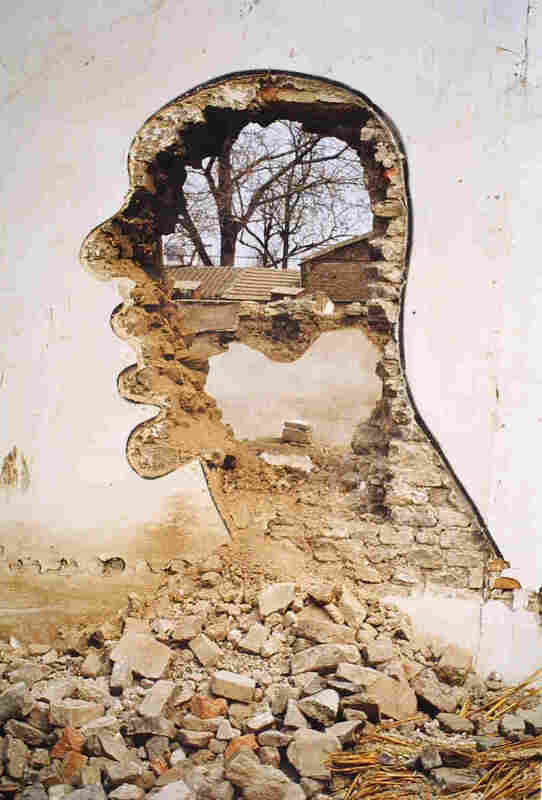 Zhang Dali; Demolition 2, 1999. Zhang's artwork was ubiquitous in the late 1990s around Beijing's countless demolition sites as miles and miles of old housing was destroyed. China's largest fair devoted to fine art photography opened in Shanghai this weekend. The first-time event is called Photo Shanghai and includes more than 500 works from photographers around the world. One of the exhibits drawing a lot of Chinese visitors this weekend is by photographer Zhang Kechun. One of the most striking images features a Buddha head, about 40 feet high, sitting in the middle of an open pit coal mine. "I feel the Buddha is someone that people revere," says Ji Hexiang, a nurse who's visiting the exhibit and trying to interpret the image. "The Buddha head may be there to bless and protect coal miners, to keep them safe and sound. On the other hand, these coal mine bosses pursue their own interests regardless of the costs." Zhang, the photographer, suggests Ji is on to something. Generally, coal mine barons are reviled in China. Many are seen as corrupt and greedy, often risking the safety of their workers and degrading the environment. Zhang says the coal mine owner actually became a monk and built a temple. "They dig coal every day, and suddenly one day they realize 'What I do isn't too good,'" he says. "So they came up with a way to redeem themselves. So they chose to believe in Buddhism." Steven Harris, the director and owner of M97 Gallery in Shanghai, says fine art photography only emerged in China in the late 1990s. 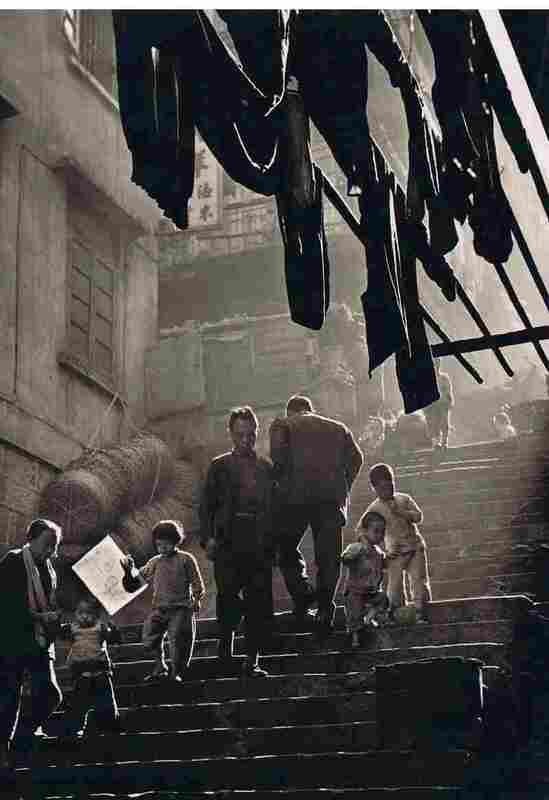 In earlier decades, the Communist Party mostly used photography as propaganda. "Compared to the West, the history and evolution of the medium of photography as a personal expression was null and void during the second half of the 20th century," Harris says. "So we're making up for a lot of lost time here." Alexander Montague-Sparey, the fair director for Photo Shanghai, says a lot of people thought he was crazy for embarking on the project. They said to him that the Chinese would "walk around this fair for 10 minutes and they'll be like, 'What the hell is this?'" But he says a lot of visitors are engaging with the works. "There's been such a dynamic response from the audience," says Montague-Sparey. "They're asking questions. They're so inquisitive." The big question is whether that curiosity will translate into sales as the market for fine art photography in China is still developing. Many visitors just seemed excited to see so much quality photography in one place. An Na, a retired worker from a state-owned tire factory, recently bought a camera and has taken up documentary street photography. She spent Friday scouring the exhibits. "Of course, there's a lot to learn," An Na says. "I can't study all of them today. I will be back tomorrow with friends."